So our impending departure was the reason I felt like I had to turn down Art Spitzer's offer of a full-time job when I returned to work. Kay Hays, in Work Orders, was leaving and he needed to fill that position. I felt like I should be honest with him, so he could find someone who would be a permanent replacement. In fact, I told him I would like to just stop working altogether to do the remaining things I had planned to do while still in Arabia, and just enjoy the rest of the time I had over there. He asked me to just take a leave of absence until after our vacation, just in case, so I agreed to that. Then when it was decided one way or the other, I could still work for Community Maintenance part-time until another permanent vacancy came up. Anyway, at that time I agreed to work for just half days until a new girl was hired and trained only. I asked him not to say anything to anybody yet about our leaving until it became official. So we made our permanent plans for our vacation to the States. We would leave Arabia on April 26th, 1978 and stay in Athens, Greece, for 3 nights, then on to London for 3 or 4 nights, then would catch the new, non-stop Braniff flight from there directly to Dallas, arriving on May the 3rd or 4th, if all went according to plan. And the part I liked best, the return to Arabia date would be June 9. In the meantime, we continued our activities. The next weekend on Thursday, March 30th, 1978, Pat and Guy Smyth came from Dhahran to spend the night with us again. There was another Al-Mojil dinner and dance at the ACC Camp and George Stein had invited us, and the others of our group left, to attend. Jimmy King and some of the others Kathi and Ruth had worked with were still there. So we all went to Jeanine and Jerry King’s before-hand, then drove on out to the ACC Camp. George was a great host and it turned out to be the best party we had there yet. I was glad, as the Smyths were there for that one. Guy and Pat Smyth at the entrance to the Dhahran Dining Hall; Pat and Colleen meeting in Al-Khobar to shop; Jeanine King, Pat, and Colleen having lunch at the Yildesar restaurant in Al-Khobar. In keeping with the escalating developments in Saudi Arabia at that time, a new six-lane divided highway was being built between Abqaiq and Al-Khobar. It would include the Dhahran bypass road and the first and only, (at that time) highway bridge in the Eastern Province, just west of Dhahran North Construction Camp. It would be part of a cloverleaf traffic interchange to help expedite the ever-increasing flow of traffic in the area of Dhahran, Al-Khobar, The Airport, and Dammam. All of this would be a really big help in getting around someday, but we still had to travel on the old road to Dhahran and transfer to another bus when we wanted to go to Al-Khobar, as I did Monday afternoon of the next week. I was just glad to still be able to go on that trip. Our last bowling night of that season was Tuesday, April 4th, 1978. My team, consisting of Gary Price, Ray Gerdes, Val Oliver and myself turned out to be the league winners. It had been an enjoyable and fun year with that group and we celebrated afterward in the Snack Bar. The next night, Wednesday, we had the Kauls and Kings to our house for dinner. Colleen at the Udhailiyah bowling alley; Colleen with her team of Etta Sutton, Lou Little, and Estela Syphers after winning the Inter-District Bowling Tournament in Ras Tanura (April 1976); Colleen Wilson and Val Oliver: the Abqaiq Tuesday night Bowling League Winners. Jack Adams had been serious about leaving Arabia as well and had asked his company, Texaco, to transfer him back to the States. So he had received notice from them that he would be going to Williston, North Dakota. They had sold or packed everything and would leave April 18th. Sheila and Keith Kaul had a going away party for them the next night, Thursday, April 6th, 1978. As we usually did for a gathering of our close friends, everybody brought something to eat, relaxed, cut up, and had a really good time. Sandy and Jack Adams; Jack Adams with false beard and mustache; Janus Verhoven and Sandy Adams laughing at Jack. Jack especially seemed happy and acted crazy by putting on a false beard and mustache, entertaining everybody with his funny antics. He was in camp a lot the next week as well, taking care of business and all the last minute things necessary to leave for good, and would pop in unexpectedly every now and then to talk and have coffee or a drink. Sandy and Jack had been such an intrinsic part of our life as well in that period of time in Arabia; they would be missed. I was still working 4 and one-half hour days the next week. I had gotten a lot taken care of in just the afternoons before our vacation but still had a lot yet to do. Another friend of ours, Axel Green, had transferred out of the Water Injection Department to the Drilling Department; so he had gone out on the rigs somewhere. We probably wouldn't get to see much of him anymore, if ever, but I did get to tell him that Kathi had gotten the zodiac puzzle rings he wanted when she was in Bankok, Thailand. She had also gotten one for George Stem. That same week at work Jimmy King had come by the office to say goodbye, as he had been transferred to Dhahran. It seemed as if our world was starting to spin and change too fast, and just fall apart. We continued our full schedule into that weekend. On Wednesday, April 12th, 1978, our friends started out with drinks at the Verhoven's house before going on to a disco dance at the Golf Club House, which was fun. The Sorority Going Away Dinner Party for Sandy and Jack was Thursday night at Caroline and Ken Casparis'. Saturday, April 15th, 1978, the beginning of the next week, was really my last day of work and that was just for 3 and one-half hours. They had found a permanent replacement, Jan Smith. Before I left I was given a little party in the office with everyone coming by to say goodbye and tell me they would miss me. Believe me, I would miss all of them as well. I felt lost the rest of that day, and in fact, the rest of the time I was in Arabia. I knew that a big, wonderful, important part of my life had just come to an end. But I would always have cherished memories of every minute of it. Sandy and Jack did leave Arabia for good on Tuesday, April 18th, 1978. We didn't know it at the time, but they would end up in Quinto, Ecuador for a time. They never could sell their little Volkswagen station wagon that we all called the "mumbles mobile", so they just left it there. We had had a lot of good times in that vehicle, and with the Adams. As it turned out we would see more of them as well in the years ahead, so all was not lost. That weekend on Thursday, April 20th, we went to Dhahran to spend the night with the Smyths. They lived in one of the new townhouses, and their upstairs guest bedroom with a bath almost felt like home to us. Pat and Guy worked their magic and prepared us a delicious Mexican meal to help get us prepared for the good old U.S. of A. again. An Arab Dinner, called a Kabsa, had been planned for Saturday night, April 22ns, 1978, for all employees of Community Maintenance, including the women and their husbands. I was grateful that they included Oran and myself, as I would have hated to miss that. It was held in what was called ‘the work yard’ behind the maintenance office building. Colorful Arab rugs were spread on the ground with large cushions lining the back wall and fences in the area selected. There was a lot of fun, laughter and camaraderie, while we sat on the rugs and ate the delicious lamb, rice and fruit brought by the Dining Hall Staff. I thoroughly enjoyed every minute of it. Art Spitzer on a rug; other Arab employees sitting around; Jerry and Jeanine king and others gathered around food; Sheila and Colleen; Guests enjoying the food (2 pictures). 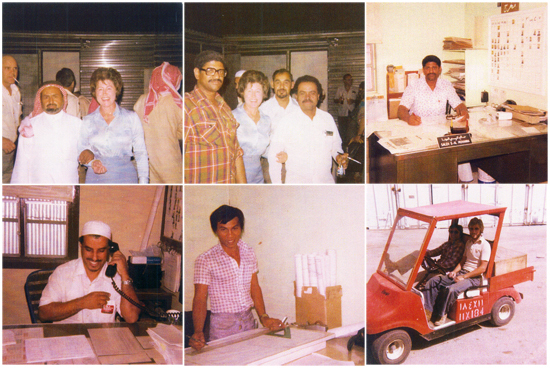 Colleen with employees (2 pictures); Big Saleh at desk; Supervisor at desk; Felix; Keith Harris and Kevin Conlon.